Mill Creek Flood Warning System (OR) | WEST Consultants, Inc.
WEST Consultants is assisting the City of Salem, Oregon in the development and implementation of a Flood Warning System (FWS). 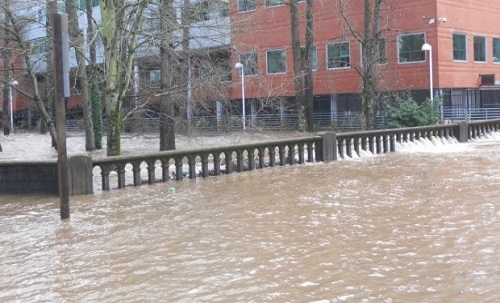 The FWS is intending to provide warning of flood events along Mill Creek, a 115-square mile tributary to the Willamette River that flows through the City. The majority of the watershed area of Mill Creek lies outside of the city in Marion County. A number of historic flood events have occurred along Mill Creek that have caused significant damage in the City of Salem and upstream communities. Most recently, such flooding occurred in January 2011. Major flood events are typically associated with rain-on-snow events resulting from a “Pineapple Express” storm system. Wet antecedent conditions followed by deluges of warm rain on a significant snow pack have been associated with the major floods in both 1964 and 1996. Implementation of the FWS is intended to provide early warning to the Community, allowing for improved emergency preparations and better implementation of temporary flood proofing measures. As part of the first phase of development, WEST was retained to conduct a review of current stream gage and rain gage locations within the watershed and to provide site recommendations for additional stream and rain gages to be deployed as part of the flood warning system. A detailed reconnaissance was conducted to characterize reaches along Mill Creek and Beaver Creek and to evaluate and rate potential sites for future gage installations as well as provide specific equipment recommendations best suited for each site. A GIS-based analysis was conducted to characterize watershed parameters that affect basin hydrologic response such as rainfall, elevation, soils, and slopes. An HEC-HMS hydrologic model was developed for the watershed in order to gain an understanding of the hydrologic response time of the overall watershed compared to a selection of the potential gage sites. Understanding flow timing within different portions of the watershed is essential to determining the viability and value of potential gage sites as part of a flood warning system. The results of the field reconnaissance, the GIS Desktop analysis, and the hydrologic model were used to provide a selection of recommended locations for new stream and rain gauge sites which will best serve as stream forecasting points and complement existing sites. In the second Phase of the FWS development, WEST was retained for development of an HEC-HMS Hydrologic Model, HEC-RAS Hydraulic model, and HEC-RTS system to link the models with data from the gage network and National Weather Service QPF forecast data. RTS will allow City staff to run the models and create forecasts of flows to be expected along Mill Creek with the City. Based on the forecast model output flood warning info will be defined. Pre-developed flood risk maps will be made available to the public via the City’s FWS webpage. WEST will install the HEC-RTS system on City computers and train city staff for its operation.